Stormwater step pools are defined by its design features that address higher energy flows due to more dramatic slopes than dry or wet swales. 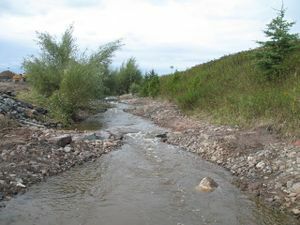 Using a series of pools, riffle grade control, native vegetation and a sand seepage filter bed, flow velocities are reduced, treated, and, where applicable, infiltrated. to shallow groundwater. The physical characteristics of the stormwater step pools are similar to Rosgen A or B stream classification types, where “bedform occurs as a step/pool, cascading channel which often stores large amounts of sediment in the pools associated with debris dams” (Rosgen, 1996). These structures feature surface/subsurface runoff storage seams and an energy dissipation design that is aimed at attenuating the flow to a desired level through energy and hydraulic power equivalency principles (Anne Arundel County, 2009). Stormwater step pools are designed with a wide variety of native plant species depending on the hydraulic conditions and expected post-flow soil moisture at any given point within the stormwater step pool. This page was last modified on 21 May 2018, at 08:32.